An example of resolutely old-fashioned cinematic storytelling with clearly-drawn characters and straightforward themes, The Lost City of Z may not be interested enough in anything other than its absorbing story to accurately be described as “important” or “compelling” or “powerful”. But James Gray’s handsome, thoughtful, expertly-crafted screen adaptation of David Grann’s acclaimed and popular non-fiction book about an English explorer determined to locate the remains of a lost civilization in the Amazonian jungle draws you in with sturdy seductiveness. Gray pinpoints an unlikely and previously-ungrasped artistic kinship between the measured historical epics of David Lean and Werner Herzog’s wild and woolly arthouse meditations on obsessive colonialist madness in the lethal subtropical wilderness. His movie settles into this particular space with slow confidence and narrative ease, rarely summoning either overt imperial critiques or metaphorical political conclusions. Despite that (because of it? 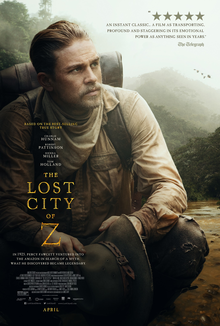 ), The Lost City of Z tells us more about what white European explorers were really looking for in what were, for them, the remote corners of the known world. This particular explorer is Percy Fawcett (Charlie Hunnam). An Edwardian-era British Army officer on the make, Fawcett hopes to parlay dedicated military service across the Empire into career and status advancement. The film opens with his (and director Gray’s) bravura display in a baronial elk hunt in Ireland, a success that he hopes will translate into the name-making notice of honoured dignitaries but is stymied by a family name tainted by his India-born cricketer father’s undetailed public shames. It’s a case study in Fawcett’s frustration, and it motivates him to accept a commission from the Royal Geographical Society (of which his father was a member) to survey the jungle river boundary between Bolivia and Brazil, the potential flashpoint of a border war between the South American nations. Leaving behind his intelligent and progressive-minded wife Nina (Sienna Miller) and their young son Jack in England, Fawcett is joined by right-hand man Henry Costin (Robert Pattinson, hiding his faded matinee-idol light in a bushel of a beard) and a small crew, who brave the dangers and hardships of the Amazonian rainforest to find the river-border’s source and settle the percolating boundary dispute. They are guided by the inscrutable Amazonian Indian guide Tadjui (Pedro Coello), who along the way tells a rapt Fawcett about a populous city of gold hidden in the unforgiving jungle, a tale backed up by ancient pottery fragments and carven symbols that he finds deep in the jungle. The tantalizing promise of this El Dorado-like discovery, dubbed Z by Fawcett upon his successful return to England, drives forward an obsessive quest to return to the region and obtain proof of its existence. In addition to the fame, glory, and distinction that such a discovery would grant him, the liberal Fawcett seeks to dispel the arrogant racism of British Imperium by showing the Amazonian “primitives” to have been more advanced than Europeans at some point in the documentable past. Although Fawcett’s second expedition wins RGS support and patronage, both its progress and its aftermath are seriously hampered by the involvement of the prominent biologist and polar explorer James Murray (Angus Macfayden), and a rematch with the jungle is prevented by the outbreak of the First World War (in which Fawcett and his exploring team serve together) and only becomes possible when his eldest son Jack (Tom Holland) displays a passion for Amazonian exploration that rekindles his own. Shot in Northern Ireland and Colombia, The Lost City of Z is a frequently gorgeous film. Gray cribs from the David Lean playbook of visual majesty, and captures many shots of magnificently beautiful skies against which his characters are semi-symbolically silhouetted. Such imagery aside, The Lost City of Z is notable for its conspicuous, classic-film-type lack of subtext. Gray establishes the shifting motivations for Fawcett’s expeditions very clearly, often through direct dialogue: initially interested in mapping Amazonia only as a way of climbing the social ladder in Britain, Fawcett then becomes convinced of Z’s existence and achieving the shift in domestic perception that existence would entail, before simultaneously being enervated by his son’s energy for the quest and his own quiet hopes of building a lasting legacy and thus launching his precarious third expedition. There’s never much doubt as to what Fawcett is thinking at any given moment, because he’ll usually tell anyone within earshot, or else someone who knows him well (generally Nina, but sometimes Costin or even Jack) will read him exactly right. The casting of Hunnam, who specializes as a sort-of film lead in men of robust physical exertion with quasi-soulful inner lives lurking barely beneath the surface (and absolutely no deeper), is highly appropriate and communicative of these tendencies to directness. Gray is able to more subtly complicate Fawcett’s personal views and the political dimension of his search for Z. Fawcett and Nina talk about how they consider each other equals in a society that firmly does not, and she offers him such vital aid him in researching for supporting evidence of a lost Amazonian settlement that she feels she should be next to him as he delivers his triumphal RGS speech (women, of course, are not allowed anywhere but in the gallery). But when Nina expresses a wish to join him on his second expedition, Fawcett rejects the idea absolutely and retreats to the patriarchal conceptions of the division of the sexes, contrary to his support of her feminism. Likewise, Fawcett poses as an enlightened figure as concerns the South American native peoples, decrying their practical slavery on European-run rubber plantations as well as smug dismissals of their savagery among his learned RGS fellows. But his views of the Indians run towards noble savage archetypes, and his vaunted friendly, cooperative approach to them on his second expedition doesn’t work so well on his third, with dire consequences. Gray, who wrote the screenplay as well as directed, also seeds his predominantly classical cinematic canvas with what might be called Herzogian touches, doodles of surrealism, instability, and modern disquiet. When Fawcett and Costin come upon one of the rubber plantations, they wander into an incongruous opera “theatre”, a semi-grotesque Gilded Age vanity carved out of the hostile jungle. A crew member who goes overboard of their river-raft during a native attack is rapidly reduced to a crimson mist by ravenous piranhas. A reading of Fawcett’s future destiny given by a Russian fortune teller in the WWI trenches magic-realistically transports the explorer and the fortune teller into the Amazonian boughs, a juxtaposition semi-repeated at the film’s end, as Nina walks out of the ornate Victorian RGS HQ into the verdant rainforest that consumed her husband and son. That consumption by the jungle and its native cultures is visualized in the Fawcett men’s final scene, a milder callback to Apocalypse Now, a jungle-bound anti-imperialist commentary of another age and a more extreme bent: they are carried by torchlight in an Indian ritual into the maw of the deep dark that they sought to penetrate with the enlightened beams of Empire. Does Percy Fawcett understand more about the people of this world and their harsh but rich environment for having “explored” (and mapped, an act redolent of possession via regulated documentation) that environment? His fate suggests otherwise, but like all romantic adventurers, what he sought in the far reaches of the known globe was, above all, greater knowledge of his own uncharted depths. A confidence spilling into arrogance is a necessary prerequisite of the imperial explorer, for how else could unveiling the basic reality of people of an unfamiliar culture be construed as a path to self-realization for a single man? That Percy Fawcett’s perspective represents the progressive bleeding edge of the imperial project, the kind outstretched palm of its invasive tendrils, does not reduce its colonial scope and intent. Critics of Fawcett’s Z-related fancies contemporary and modern found his quest to be ridiculous and self-serving, his mysterious disappearance an apt fate, regardless of the subsequent limited vindication provided to his theorizing by the unearthing of the archaeological site of Kuhikugu. But all men search for themselves, one supposes. Some just have to go much further to find what they seek.